For Visitors, Mashpee is the premier shopping and dining destination on Cape Cod. With shopping plazas of varying sizes tucked in all around town, Mashpee boasts a variety of small shops, boutiques, fine dining establishments, family-fun venues, and pedestrian-friendly spaces for a pleasant day out. Not into shopping? Mashpee shares the same natural beauty as the rest of Cape Cod. With salt water and fresh water beaches, visitors and residents alike will enjoy the unaltered beauty of Mashpee’s water-fronts. On a rainy day, there are museums (including the Cape Cod Children’s Museum), art centers and galleries, and indoor activities suitable for people of all ages and with all interests. For residents, Mashpee is growing into the little town of dreams. The High School is home to new and exciting technologies that stimulate the creativity and learning of the next generation. The chamber is proud to support those very students in their continued education. Green initiatives keep Mashpee at the forefront of global altruism. And groups such as Heroes in Transition, Inc, and LIFE, Inc, work to place military service members and adults with unique learning challenges to work in and with their community. These examples just scratch the surface of the benefits of residing in Mashpee. For business owners, Mashpee is an obvious choice. With so many visitors, merchants are exposed to new guests all the time. Off the beaten path, in Mashpee, there are opportunities for larger businesses to build their home. And with the support of the network we are working to establish and maintain at the Chamber of Commerce, Mashpee will continue to grow as a healthy business community. At the heart of Mashpee, the Wampanoag Tribe beats strong. Having just moved to a new location that reflects the history and represents the future of their government and enterprises, the Tribe is an integral and foundational aspect of the Mashpee community. The first people of Mashpee grace this town with integrity and roots that go deeper and grow stronger than most people get the opportunity to experience. Whether you’re stopping by for a day out shopping, looking for the perfect elementary school, opening a new restaurant, or interested in art and history, Mashpee is a beautiful Cape town with something to offer. The town of Mashpee has a rich and tumultuous history. Inhabited for thousands of years by the native Wampanoag, and inhabited by English settlers in the mid 1600’s, the town was not incorporated until over 200 years later, in 1870. Since it’s origins, the town of Mashpee has grown into an exciting community with year-round offerings for residents, visitors, and business owners. Mashpee is also a highly charitable community with a high concentration of non-profit organizations doing business in Mashpee. Additionally, “Mashpee has more than five miles of sandy beaches on Gulf Stream-warmed Nantucket and Vineyard Sounds, extensive waterfront on Waquoit and Popponesset Bays, and four of the largest freshwater ponds on Cape Cod all for boating, bathing and fishing. Our hub location gives access to twenty or more golf courses within a fifteen-minute drive, including Mashpee’s three world-class championship golf courses. Mashpee is home to nationally recognized Mashpee Commons, a community shopping center noted for its traditional New England-style architecture.” – Mashpee Virtual Town Hall. 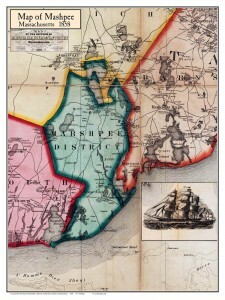 A 2013 Street Map of Mashpee is available for purchase of $8 at the Town Hall, or for viewing online as a PDF. Please visit the Town Hall’s Geographic Information Systems (GIS) page for a link to the Street Map of Mashpee.